The Commonwealth and State governments exercise the royal prerogative all the time. They enter treaties, deal with wastelands and pardon offenders. Usually the prerogative fits with modern constitutional arrangements and is not given a second thought. However, the curious example of the prerogative to swans does give pause for thought. The medieval origins of the prerogative highlight the authoritarian foundation of all prerogatives; it arose as an arbitrary confiscation of valuable property when the King was a despot. That the Queen still asserts a prerogative to swans today, long since swans ceased to be valuable as a commodity, shows that the prerogative can persist on its own steam, even though the original reasons for the prerogative have fallen away. Yet a prerogative to black swans has never been asserted, revealing there is a limit to the prerogative’s inertia. In the end, the prerogative remains a means to exert power. Australia’s extradition processes are governed by legislation, a range of treaties and a rich case law. Extradition cases typically cross over administrative law, criminal law, international law and specific principles developed in the field of extradition law itself. 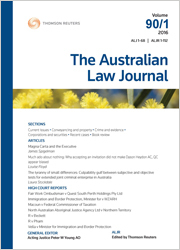 This article discusses the legislative regime governing the implementation of extradition treaties under Australian law, and jurisprudence expounding upon the effect of extradition treaties on extradition requests, both by Australia and to Australia. The article focuses in particular upon the context in which extradition treaties fall to be construed by reference to two recent High Court decisions. The article raises the question whether extradition jurisprudence demonstrates due regard to the overarching international crime co-operation regime within which extradition processes are conducted, the circumstances in which extradition treaties are negotiated, and the frame of reference afforded by international law. There is no legal definition of social enterprise in Australia, nor a specific structure that is designed to distinguish between “for-profit” and “not-for-profit” social enterprises. In Australia, if for-profit social entrepreneurs do not wish to rely on co-operatives as a business model, they will have to use traditional forms of legal structures such as companies. It is estimated that 18% of social enterprises in Australia use the proprietary limited corporate structure. In view of this, the authors have focused on the use of proprietary companies by for-profit social entrepreneurs to determine whether this traditional business structure can strike a balance between profit generation and the social purpose of the enterprise. The article therefore aims to highlight the advantages and disadvantages of this form of business from two perspectives: a corporate law perspective and a taxation perspective. The Rule of Law and the Australian Constitution, by Lisa Burton Crawford. For the PDF version of the table of contents, click here: ALJ Vol 93 No 2 Contents.